A few weeks ago, I installed a new electric stove in my home. Following the manufacturer’s specifications, I bought some electric cables that had been imported from China and installed the stove. I studied physics up to tertiary level, so I knew what I was doing. After a few days, there was a short circuit: the cable had melted and the wires inside were now exposed, despite the fact that the cable was not directly exposed to heat. I went out again and this time I was looking for a cable specifically NOT MADE IN CHINA. I found one made in Africa and it has been working perfectly ever since. Our government here in Zimbabwe, and many governments in Africa, have failed to protect us from an influx of imported goods that affect our local industry and render a lot of people jobless. They have also failed to protect us from sub-standard goods that are not worth the money we spend on them. China has taken advantage of our fragile economy to abuse us: the majority of people in Zimbabwe do not have much disposable income, and Chinese goods are priced lower than locally manufactured goods. To a person living in near poverty, it might seem reasonable to buy the Chinese goods, but it’s only a lucky few who get to use them for more than a week. We have Chinese shops on every street selling sub-standard goods. The only purchases it’s not worth complaining about are children’s toys – no-one expects them to last. But my argument is not that China generally manufactures sub-standard products. No. It is that they bring sub-standards goods to Africa, and that is a blatant abuse of our human rights. China has found a weak spot in the armour of African leaders. Turn a blind eye to our deplorable human rights records, our leaders say, ignore corruption and the looting of state resources, and we will give you free rein in our countries. It is a government’s duty to provide for and protect its people. In democratic countries, if a government fails to do that, it is voted out of power. In countries were democracy is frowned upon, the people have to resort to uprisings. And in countries were the people have been beaten into docility? Many autocratic countries do not see any requirement to ‘protect’ its citizens beyond building very big and expensive armouries and, once in a while, killing a number of citizens to ‘protect’ them from imperialists who want to re-colonize them. 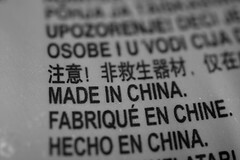 I recently saw some goods made in Zimbabwe bearing the sticker: NOT MADE IN CHINA. This is a direct response to an influx of sub-standard Chinese goods that have flooded our market and effectively destroyed our economy and made us poorer in the process. There was much anger in South Africa in 2010 when ANC MP Shiaan-Bin Huang’s company Ascendo Industrial was awarded the contract to manufacture two million figurines of Zakumi (the World Cup 2010 mascot). Ascendo outsourced the work to a Chinese company, Shanghai Fashion Plastic Products and Gifts. Cosatu, a South African trade union federation, was not happy about this – particularly given the recession and government’s promise to pay attention to local job creation. But according to an article in the Sunday Times, more than 500 Chinese workers were each paid just $3 a day to make the Zakumi toy figures, which went on to retail for approximately $48. How can local manufacturers compete with that? The government has to protect them. Yet with the blessing of our ‘government’, the Chinese are systematically destroying our jobs and robbing us of the little money we have in exchange for shoddy goods.